Time’s Answers Issue is here, and it looks like a good one. The magazine explores a wide variety of subjects through the lens of big data. In this issue, we’ve tried to use the new tools and data sets at our disposal to ask and answer questions that seemed important (When will Congress reach gender parity? ), as well as fun (Where exactly should I sit to catch a foul ball?). We ended up answering some questions we didn’t know we had (Why don’t we get heart cancer?). We also used data to investigate the issues that define our times and tell us who we are. But what’s most exciting about our age of answers is its potential to change the quality of our lives. There’s also an interactive element available at Time.com/answers. We used the “How Safe Are You From a Natural Disaster?” feature to figure out that the safest place in the nation is Sweet Grass County, Montana. Oh, and Californians? You’re all pretty much f*cked. 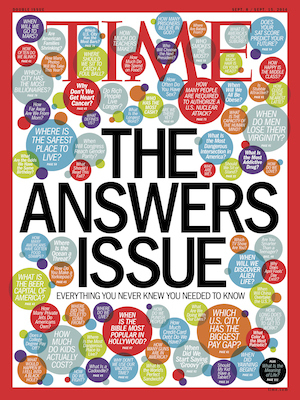 Time’s Answers Issue hits newsstands tomorrow.